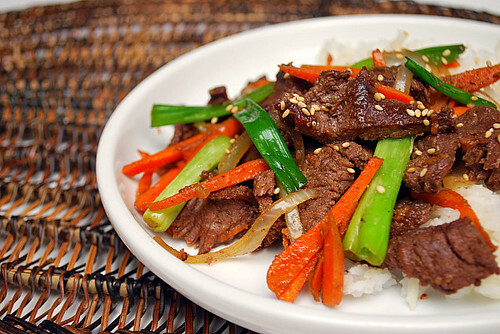 Korean Bulgogi is a dish of thinly sliced sirloin beef that's marinated overnight. Once marinated, it's grilled or cooked in a hot skillet with julienned carrots, green onions and white onions. But the key part of this dish is the marinade. It's a soy sauce based marinade with sesame oil for flavor and aroma, garlic, sugar, seasonings (garlic powder, onion powder, salt and pepper) and pear nectar. It may seem odd to have a fruit nectar included but it adds a nice bit of sweetness and is said to help tenderize the beef as it marinates. * You can find pear nectar in the juice aisle and/or in the Hispanic/Latin food aisle, oddly enough. Look for the Kern's, Goya or Jumex brand that's sold in 12 oz cans. In a large resealable plastic bag, combine soy sauce, sesame oil, sesame seeds, garlic, sugar, salt, black pepper and pear nectar and add the beef. Seal the bag and distribute the marinade throughout the beef. Allow the beef to marinate for at least 3 hours, however overnight is best. In a large skillet (I use my cast iron skillet) over high heat, add a tablespoon of oil and heat until shimmering. Remove the beef from the marinade and place in the hot skillet. Discard marinade. Brown the beef on both sides and then add the carrots, green onions and sliced white onions. Cook until the vegetables start to become tender but still maintains a slight crunch. Serve over steamed rice garnished with more sesame seeds or in large lettuce leaves, rolled up and eaten like a burrito. Alternatively, you can cook the beef on a gas/charcoal grill and saute the vegetables separately. I love bulgogi but I normally use the mix. thanks for sharing the recipe. Bulgogi is my husband's favourite Korean dish. Your post reminds me that I haven't made it for some time. Your bulgogi looks delicious! I bought the ready made marinade to try and it was delicious BUT lots of MSG. THANKS for posting this, we are now addicted to bulgogi. I serve the meat on rolls with pickled veggies. I love korean food. I've never attempted bulgogi at home. Your post has encouraged me to make it. Thanks for sharing. My husband is Korean so we eat this a lot. The butcher freezes the meat so that it can be shaved it is wonderful! I made this tonight, and having never eaten Korean I wasn't sure what to expect. We enjoyed it, although I would have liked a bit more flavor. Love Korean bulgogi, but I've never tried making it myself. This looks so easy-can't wait to try it! !